**The Pony Barn is closed for the season and will open again in April 2019! Check our Events page for upcoming parties! 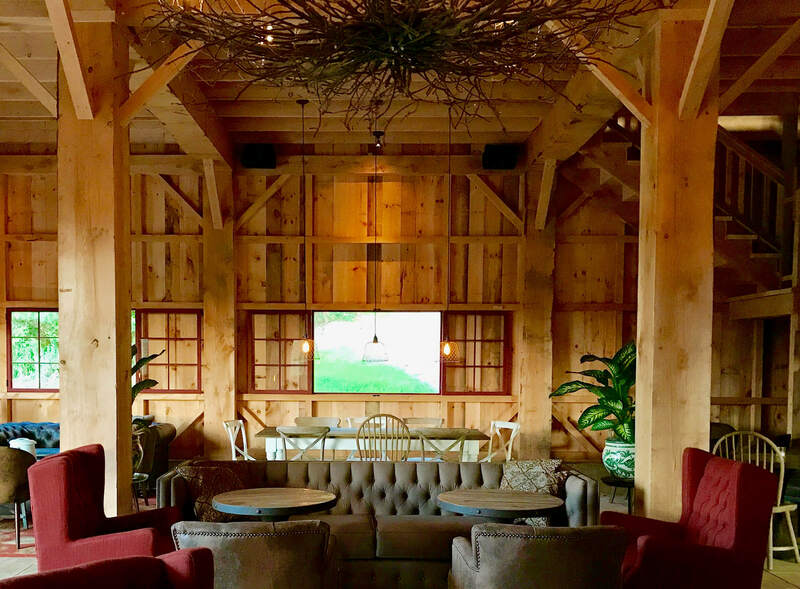 One of our favorites spots on the farm is a beautiful cocktail lounge we refer to as The Pony Barn. 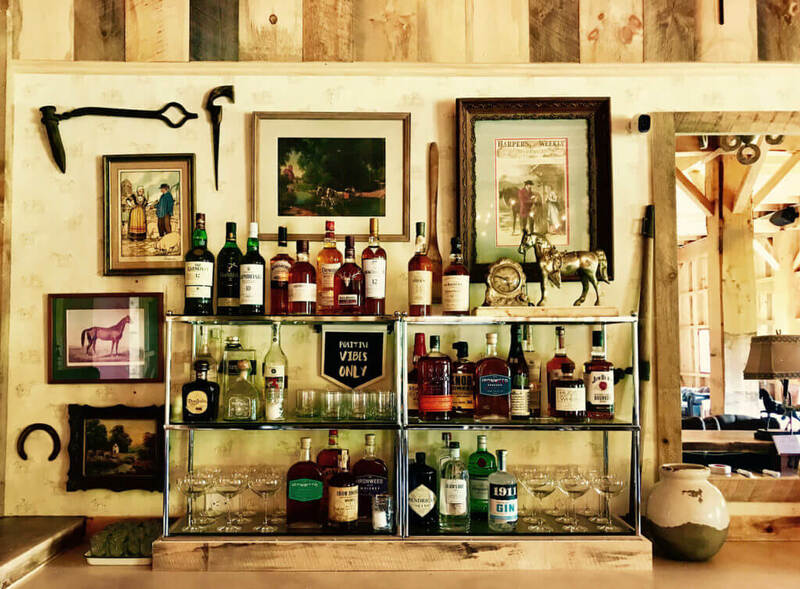 The Pony Barn is a private event space, but is ALSO open to the public Wednesdays – Saturdays from 5-11pm for cocktails and food! Tuesdays: Wellness Night at the Farm. Check our Events page for all of the different wellness classes we offer! Wednesdays: Rotating Chef Night. Also, Matt & Tess bartending (!!!) 5-11pm. Open for adults only 21+. Thursdays: Family Night 5-11pm. This is the ONLY day of the week that we allow children, or anyone under the age of 21. We also do not take reservations on Thursdays, as parking on Thursdays is on a first come first serve basis. $10 admission/car on Thursdays. Friday & Saturdays: Open 5-11pm for adults 21+. We are closed Sundays & Mondays except for private events. How do you make a reservation for The Pony Barn at June Farms? For starters, you do not NEED a reservation for The Pony Barn. In fact, we only take table reservations for parties of 8 guests or more. It is also important to note that the admission fee per car does not guarantee you a table. Seating is on a first come first serve basis at The Pony Barn. However, if you have a party of 8 guests or more and would like to reserve a table on Wednesdays, Fridays and Saturdays, please text or call our reservation line at (518) 444-FARM. Because of the high number of messages we receive, leaving a message or sending a text does not guarantee your reservation. We will reply back to you when your reservation is confirmed. What food do we serve at The Pony Barn? On site at The Pony Barn is a rustic, wood fired pizza bar serving delicious, farm-to-table artisanal pizzas for you to enjoy while having some cocktails. Yes, gluten free crusts are available :). They are individual pizzas, made from fresh, local ingredients. You can bring your pizza into the bar, or bring your drinks out to the pizza bar and talk to Chef Helen and staff while they make your pizzas! On Wednesday evenings from 5-11pm, we offer a rotating farm-to-dinner menu. Please visit our Facebook or Instagram page for more details on each week’s special. The Pony Barn is only open seasonally from May – December. We do offer private events on the farm throughout the year, however. Because The Pony Barn is a bar for adults, we require all guests be 21 years of age or older, except on Thursdays (Family Night). Well behaved, leashed dogs, who will not eat our barn cats or our free range chickens, are allowed on our patio. On Wednesdays, Fridays and Saturdays, we charge a $5 Admission to enter June Farms per car. On Thursdays, it is $10. This fee helps pay for the parking attendants we need on site to help answer your many questions, and it also helps pay for the incredibly high cost of running a heritage breed farm for you to enjoy. With this parking admission, it includes the opportunity to walk the farm and meet all of our animals. If you are looking to rent The Pony Barn for a private party, please email our farm owner, Matt Baumgartner, at JuneFarmsEvents@gmail.com.